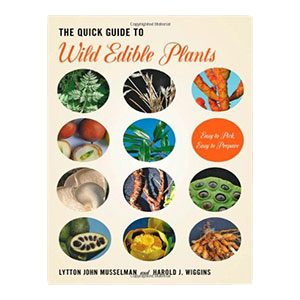 Wild edible greens are leafy green plants that grow in wild unattended places all over the world in many different climate zones. They're not just for emergency survival situations, but are actual leafy foods that are very nutritious to incorporate into meals and salads from time to time. Albeit a bit different than the typically greens we might find at the local supermarket, these are varieties that are created in the uncultivated soils found in "nature's garden" and are FREE of charge to any food forager. 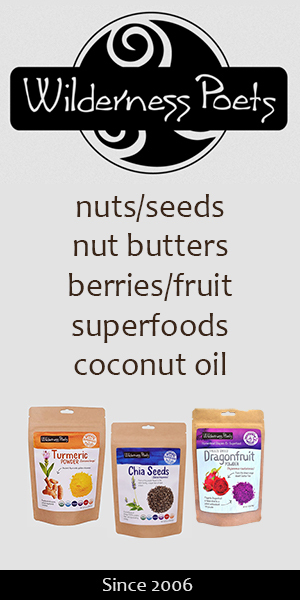 These specific types are edible to humans and are good to include in the diet whenever they are seasonally available. Consuming a varied intake from different species throughout the year, can be a great way to get an array of other phytonutrients not typically found in cultivated foods. It is good to become familiar with about 10-20 wild green types, what they look like and where they grow in your native region or travel destinations. When it comes to eating wild harvested leaves, plant identification is absolutely critical as there are many poisonous look-a-likes and sometimes deadly plants to be aware of. For the wildcrafting newbie we highly recommend purchasing a good wild plant identification guide or doing online research to positively classify any wild green before you consume it. Foraging for wild food is one of humankind’s most basic survival instincts that has long been forgotten since the invention of large scale agriculture. Although, human societies throughout history have utilized wild collectibles for medicinal and food purposes, today it is not a commonly sought out practice. 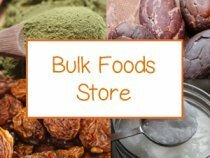 While there is a small and growing community of individuals who are beginning to, once again, realize the nutritional diversity and value that these foods can provide, many modern day lifestyles, compared to only several decades ago, are not as seeming interested in shopping for produce in the great outdoors. Most of us, however, could use more direct connection with the grounding balance that nature can provide and harvesting wild edibles can be a very rewarding way to integrate this element back into our lives. 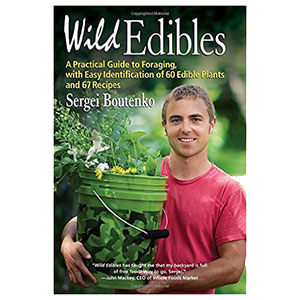 Different types of wild edible greens can be wildcrafted all year long, depending on the region and climate zone. They most commonly grow in zones 4-8, but can extend to zones 2-9 depending on the species. Many kinds enjoy cooler spring-time temperatures and adequate rainfall with partial sunlight, while others can be found in hot dry climates with full sun exposure. Once you become familiar with the species available in your local area, you can pretty much guarantee they will be there year after year. Although quantity may vary depending on the weather conditions, which may fluctuate with any one given season, these plants are hardy and vigorous once they take root and/or lay down seeds. They can be found in most any natural environment from the deep wilderness to front yard lawns as well as abandon fields, meadows, sea cliffs, mountaintops, forested foothills, riverbanks, urban parks or even cracks in city sidewalks. For the purest and highest quality we tend to recommend harvesting your greens away from any atmospheric pollutants, roads or industrial areas. The list of our top favorites further below are common edible wild greens that can be found in many moderate climates around the world. Wild greens are the origins of all hybridized green leafy vegetables we know today and while they are much smaller in size, they are considerable more condensed in quality medicinal and nutritive constituents. 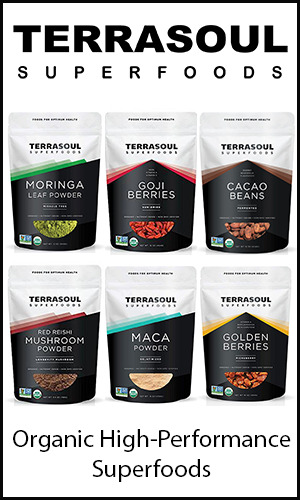 Although cultivated variations have their place in modern day living, there is no comparison to the wild untamed nutrients that these edibles can provide and we largely encourage including a portion of them in the diet throughout the year whenever they are available. Growing prolifically in uncultivated patches of earth, natural non-hybridized leafy greens can be a great wild superfood adjunct to a health promoting diet and lifestyle. 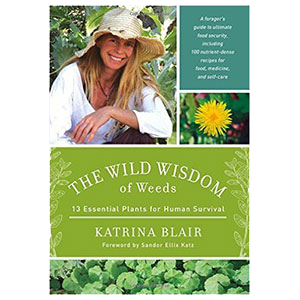 These greens and herbs are often called "weeds" because they are tenacious, hardy and tend to propagate quite easily when given the slightest opportunity to do so. This is not the case with standard garden vegetables that cannot thrive in wild habitats, untended by human hands. 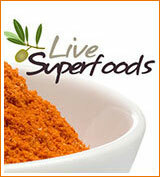 It is extremely beneficial to eat foods that are innately strong and vigorous. These are signs of their potency, containing higher amounts of vitamins, minerals, amino acids and chlorophyll as well as concentrations of species specific plant-based compounds. The taste of wild edible greens can take some getting used to if your palette is accustomed to cultivated variations. Most have strong "green" flavors and others can be quite bitter. However, these are qualities that make them highly nutritious and helpful for stimulating digestive juices and cleansing the body systems. 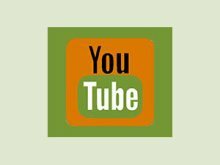 These tastes can be camouflaged, if they are not to your immediate liking, in blended drinks, green juices, green smoothies and many raw and cooked recipes. Many wild greens are a great medicinal food source for detoxing the tissues, reducing inflammation and clearing the lymph system. A variety of species are often found growing prolifically outdoors in springtime conditions, a recognized time of year by herbalists for cleansing the liver organ. Like shopping in "nature's produce section", wild edibles are a source of FREE food. Transfer their vigorous, self-sustaining and hardy nature. 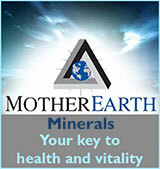 Resilient qualities, when ingested, potentially help us to naturally adapt to environmental changes and conditions. Wild edible greens are a nutritionally balanced food source, growing in untilled soils in harmony with natural surroundings. 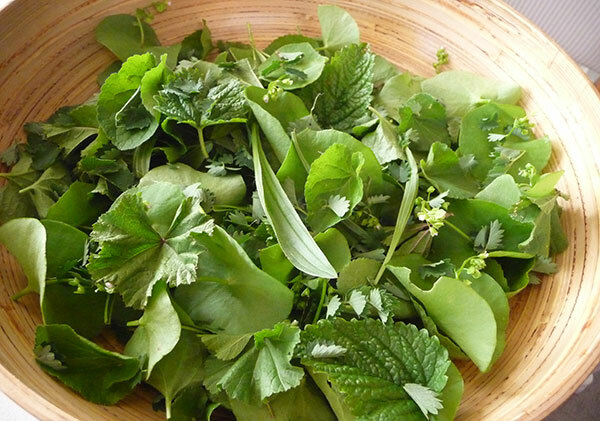 Wild edible greens are a great emergency survival food. Chicory is one of the great wild edible greens that has naturalized to many parts of the world. Commonly found as a roadside plant, it also thrives in wild field locations and most areas with heavy soil containing clay or gravel. It is a drought resistant species that tends to prefer full sun. Chicory leaves are toothed-shaped like dandelion, but is a taller-growing woody variety with periwinkle blue flowers that are also edible. The tender young leaves are an excellent digestive bitter and the roots have been used for centuries as a cleansing and tasty tea. Young gathered leaves can be used fresh in salads, or when mature, can be steamed, incorporated into recipes or dried for use in teas or as a digestive herb sprinkled on meals. 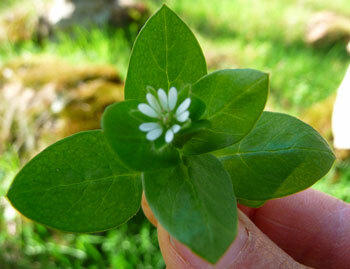 Chickweed is a soft, delicate wild edible green that grows in abundance in cool, wet, shady conditions with partial sunlight. Chickweed's tiny leaves are somewhat succulent with an oval shape and pointed tip and the plant has tiny 5-petaled segmented white flowers. Its chlorophyll-rich leaves are known for their therapeutic effects at purifying the blood and lymphatic system and have a long history of use in European folklore as a skin compress and skin healer when eaten or used topically. 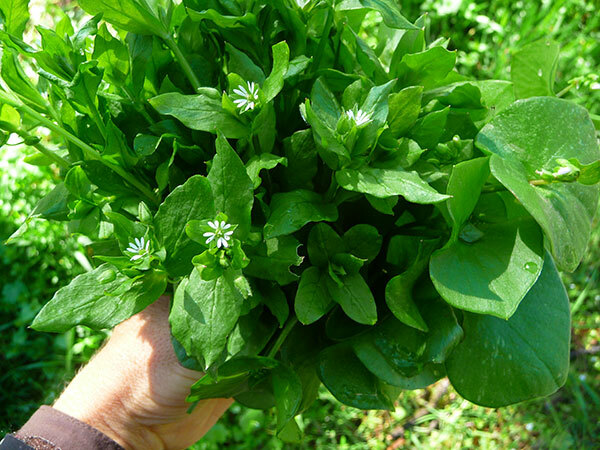 Chickweed leaves and stalks work well as a fresh herb that can be eaten raw, juiced, steamed or infused as a tea. It is however not as suitable as a dried herb as it loses potency quite fast. The young leaves of the dandelion plant, called "dandelion greens", are probably one of the most famous edible "weeds" known around the world. Their medicinal properties and bitter taste are helpful as a natural diuretic and detoxifier as well as a digestive stimulant that will increase bile flow and improve fat metabolism. 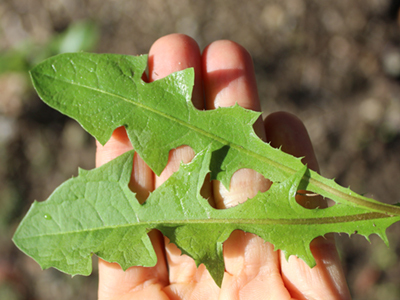 The leaves have tooth-shaped edging and are smooth not rough or hairy like "false dandelion", a common look-a-like. True dandelion also grows close to the ground as opposed to tall and upright. All parts of the dandelion plant are edible, including the yellow flowers which are known source of lecithin. Whole blossoms are frequently utilized by herbalists for making "dandelion wine." The root of dandelion can also be simmered as a gentle cleansing tea for the liver or roasted with chicory root as a coffee substitute. There are many varieties of "docks", but they all have similar characteristics. 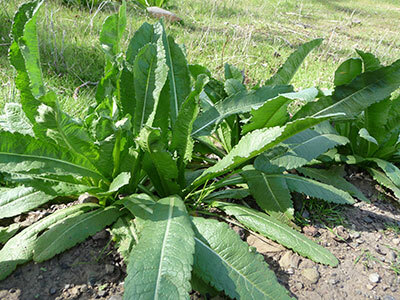 Curly dock or yellow dock are common types available as a wild edible green with leaves that can become quite large in size compared to other species. Dock leaves are known to have high levels of vitamin A, vitamin C, iron and potassium. 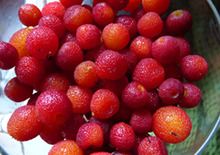 They are boosting to the immune system and have been studied as an herbal adjunct for malaria treatment. It is best to harvest dock leaves in their early stages of growth as they are known to contain higher amounts of oxalic acid as they mature. They can be consumed as a raw leafy green in moderate amounts or can be steamed to remove some of the oxalate content. The roots of dock, especially "yellow dock", also act as a powerful liver cleansing herb and can be decocted as a tea. Wild fennel is native to the Mediterranean but has naturalized to regions all over the world, often growing abundantly in coastal foothill climates and next to riverbank locations. Like many of the wild edible greens it is perennial herb and will often dry up and grow back from the same rootstock year after year in the spring season. 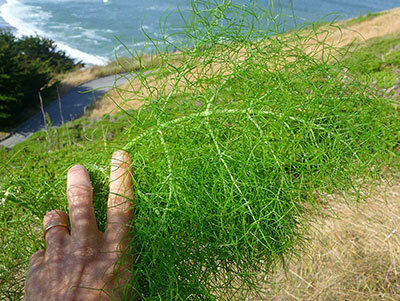 With tall hollow stems, the fennel plant can mature to heights of about 8 feet (2.5 m) and is relatively easy to identify once you become familiar with it. All parts of the fennel plant are edible, but typically the feathery leaves, seeds and fennel bulbs are most commonly utilized. The fresh chopped young shoots, mature herb or root bulb can be used for salads or raw meals as well as integrated into a variety of cooked dishes. The seeds, with their aromatic, anise-like flavor, have likewise been used throughout history as a culinary spice and a digestive herbal tea infusion for soothing gastrointestinal upset. The wild grapevine is a robust and hearty plant species that can be found in most any location that wine grapes are cultivated. 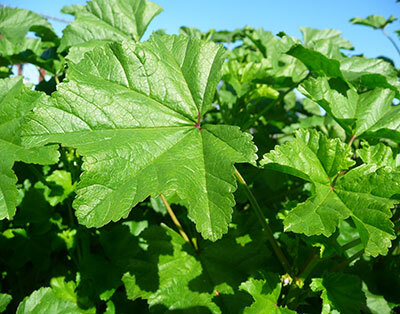 Commonly found weaving its way up trees or over bushes, wild grape typically grows near water sources alongside riverbanks, streams or close to underground aquifers. 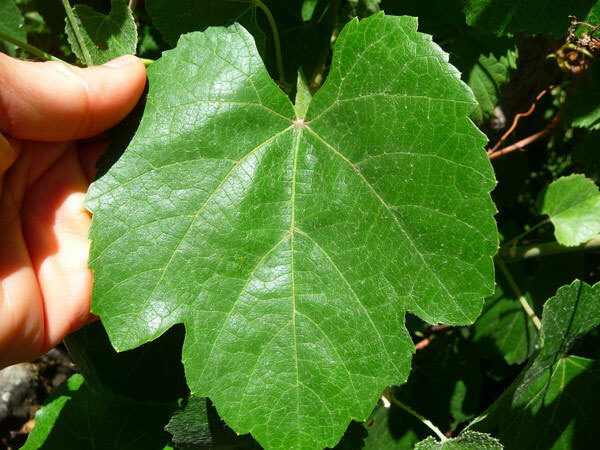 Wild grapevines produce very large leaves the size of one's hand and are a rewarding species to harvest and easy to identify. They are commonly wildcrafted in many parts of the world for use as a type of wrap for a variety of food fillings and frequently steamed, canned or fermented for use as "stuffed grape leaves" or "dolmas." The young leaves harvested early in the season can also be consumed raw or as a steamed leafy green but, because it becomes less palatable as it matures, it is usually prepared as a pickled food wrap. 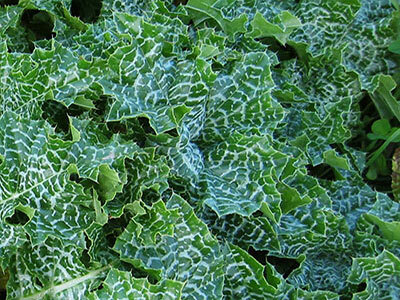 The leaves are high in fiber and are good sources of beta-carotene, vitamin C, vitamin K and calcium. This wild edible green ranges from 1-6 feet (30-182 cm) in height and is frequently referred to as "wild spinach." Lamb's quarter grows abundantly in many temperate climates. The undersides of the leaves are often whitish in color, making it somewhat easy to identify. Lamb's quarter has been a common wild food source in European cultures for hundreds, if not thousands of years. It is related to the protein-rich grain quinoa and the seeds can be gathered and cooked in much the same way. The shoots, leaves and stems are all edible. Leaves can be eaten fresh or steamed as a green vegetable. 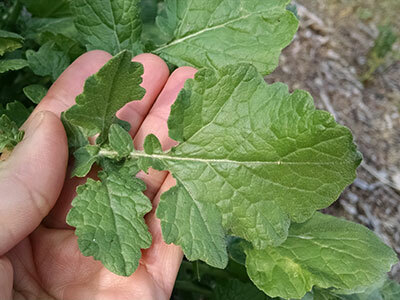 Like dock, lambs quarter is a source of oxalic acid and should be consumed in moderate amounts as a raw leafy green or steamed to remove some of these substances. Also called malva, this hardy wild edible green comes from the Greek word "malakos", which means "to sooth." The leaves of malva or mallow are soft to the touch and are soothing and calming to the digestive tract. Mallow is a great plant to start foraging if you are new to collecting wild edibles. This is because it is easy to identify as the leaves are quite large and have a lobed rounded ruffled look. The leaf growth alternates along the main stem and can become somewhat tough and fibrous as they age. The leaves, roots and flowers of the wild mallow plant are all edible and have a long history of use in herbal medicine as a wild food source. The root of the mallow plant, related to cultivated marshmallow root, is used by herbalists worldwide to treat coughs, sore throats and helps eliminate congestion. The young leaves can be consumed raw but become more mucilaginous upon maturity. 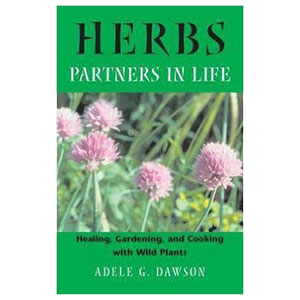 They can be utilized in green smoothie recipes or used to make wild malva or "cheeseweed" soup. While milk thistle is commonly utilized for its milk thistle seeds, it is also a large leafy edible green variety that grows abundantly in many springtime climates around the globe. 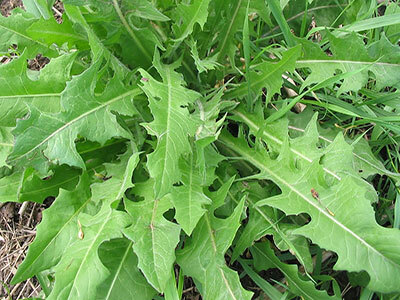 Milk thistle leaves, however, need to be appropriately trimmed around their thorny exterior before consumption. This can be easily achieved with kitchen scissors. The smooth, somewhat waxy, green leaves are identifiable by their characteristically splashed milky look and ruffled spiny edging. Milk thistle is from the artichoke family and the stems and de-thorned heads are also edible. The brown-black seeds can be harvested later in the season after the red-purple flower head dies back. They are well known for their potent cleansing effects on the liver organ and can be powdered for medicinal use. The leaves are best eaten as a steamed vegetable as opposed to a raw salad green, but can be chopped and added to salads if desired. While this rounded dainty, yet hardy, green leaf grows in large numbers throughout the California foothills, woodlands and coastal locations, it is also naturalized to similar climate zones around the world. 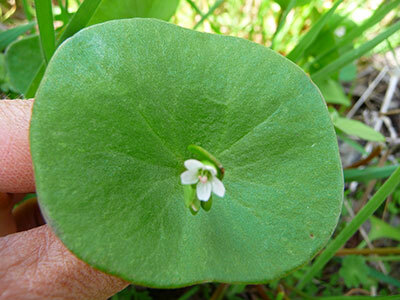 Miners lettuce is often found next to wild chickweed, enjoying partial shade and springtime weather conditions. It is closely related to wild purslane which is evident through its similar thick and succulent-type leaves. 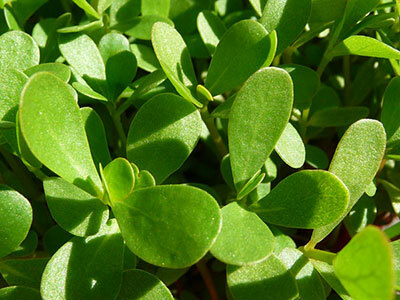 It is also, like purslane, unusually high in omega-3 fatty acid content. Wild mustard is found in many parts of the globe, commonly on seaside cliffs and coastal locations, but also grows in inland fields and roadsides. It prefers sunny habitats at an altitude between 0–4,593 ft (0–1,400 m) above sea level, preferring alkaline calcareous soils. Mustard greens are hot and spicy plants from the Brassica family of cruciferous vegetables. It is a familiar springtime herb to forage and is best eaten raw when the leaves are young. After this point they tend to develop a courser hairy texture that is better when steamed as a green leafy vegetable. 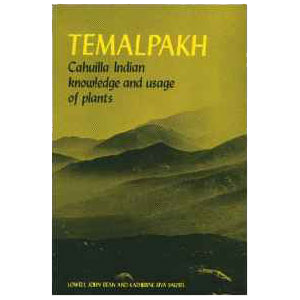 It is an annual plant usually growing about 1-3 feet (30-91 cm) tall with seeds, yellow flowers and leaves that are all edible. The seeds can be harvested later in the season to make a spicy ground mustard. Wild stinging nettles are not necessarily an edible green that you would pick and eat raw straight from the plant as they have stinging hairs that need to be processed before consuming. These hairs or "trichomes", are naturally designed to help protect the plant from insects and predators and are deactivated when the plant is steeped, steamed, macerated, dried or prepared in an alcohol or vinegar solution. 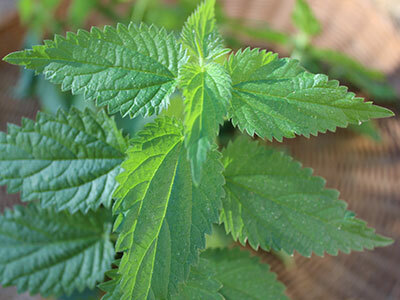 Stinging nettle is a leafy herbaceous plant that grows as a wild green all over the world in mild to temperate climate zones and is one of nature's top vitamin-mineral rich plant-based supplements available for free in many forests, foothills and coastal locations worldwide. The common nettle plant has been valued for centuries as a nutritious leafy edible and herbal tea variety that is extremely dense in energizing substances and unique plant constituents that are nourishing to the blood as well as cleansing to the body. Although the roots, stalks, stems and seeds can all be used therapeutically, the leaves are the primary part consumed as a prepared food source. While it is possible to rub off the hairs and eat the leaves, for safety reasons we often recommend that they be juiced or steamed before consumption. 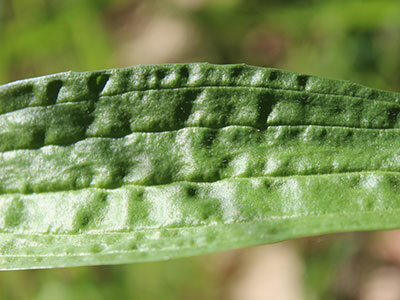 The plantain leaf, from the genus Plantago, is a long slender (sometimes oval-shaped leafy green) and low growing plant with ribbed indents running up its leaves that make it easy to identify. The new shoots are the most tender and appetizing to consume as a raw salad green or cooked potherb. 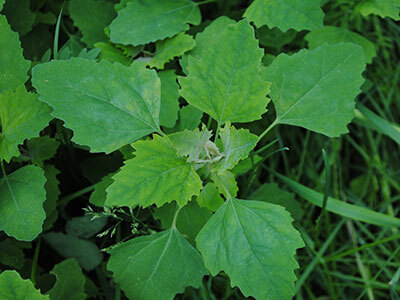 Although the older leaves can become quite bitter and astringent, they can be used medicinally via topical application as a poultice for skin ailments and bee stings. The seeds and husks of the plantain plant, also known as "psyllium", are similar to cultivated psyllium often sold in supplement form or as a bulk herb. 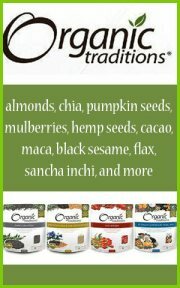 Wild seeds are likewise extremely fibrous, mucilaginous and help to increase bowel movements. The young leaves are high in beta-carotene and calcium and are a source of vitamin C content. Purslane is a succulent plant that has thick reddish stems and green oval-shaped leaves with a spreading root system that tolerates poor compacted soils. It is considered an "exotic weed" variety that commonly grows in warmer climates throughout the summer season and is fairly resistant to drought. 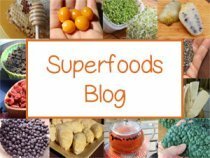 It is one of those wild edible greens, like miners lettuce that, according to a number of studies, is known to contain higher levels of omega fatty acids, especially alpha-linolenic acid (omega-3) and gamma-linolenic acid. Wild purslane is freshly harvested in East Mediterranean countries where it is utilized in many cultural dishes. It can be eaten raw and has a slightly sour and salty taste, but the leaves and stems are traditionally prepared steamed or cooked as a leaf vegetable. Its mucilaginous quality goes well in soups and stews. Salad burnet is a delicious tasting wild gourmet salad green that is very drought tolerant and can be found growing throughout the year in many climate zones. 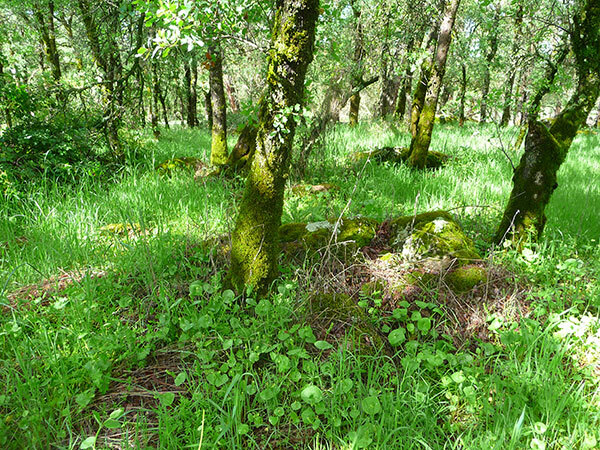 Typically suited to drier conditions and grassy foothill regions, usually in limestone soils, it is a low growing species that can reach heights of between 1-3 feet (40-90 cm). 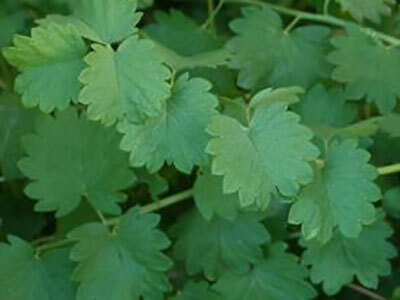 The small cilantro-looking leaves grow off both sides of a main center stem and are easy to remove by simply pinching your fingers and sliding down toward the base. As the name implies, "salad" burnet makes a great addition to any salad, but raw leaves can be used a top any meal or blended into salad dressing. They have a refreshing flavor similar to that of cucumber. Wild violet leaves come from the same plant as the tiny fragrant-smelling wild violet flower and are the wild relative of the cultivated pansy species. 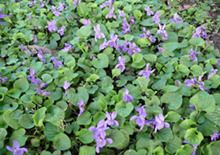 While the violet flowers are also edible and widely used in herbal syrups and honeys, not many people know that you can also eat wild violet leaves. They have a nutty and slightly spicy flavor and are classified as an alterative herb for their powerful blood purifying attributes. 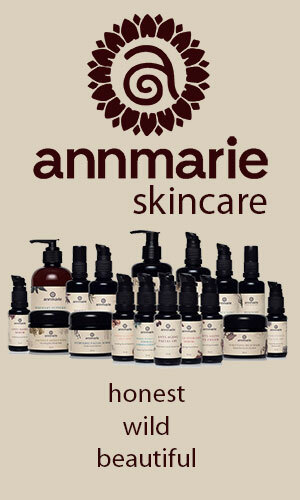 They are also likewise stimulating to the lymphatic system and are known for their skin clearing qualities. Violets are easy to locate when the flowers are present, but can also be identified by their scalloped heart-shaped leaves. They are notorious for taking over untended areas of gardens and lawns, but can also be found in natural locations near water sources. The young springtime leaves can be consumed raw in salads, but become slightly bitter as they mature. They can be used in nutritive tea infusions or tinctured for their medicinal compounds. Watercress is a fast growing wild edible green that is found in aquatic areas like ponds, streams or slow moving waterways. 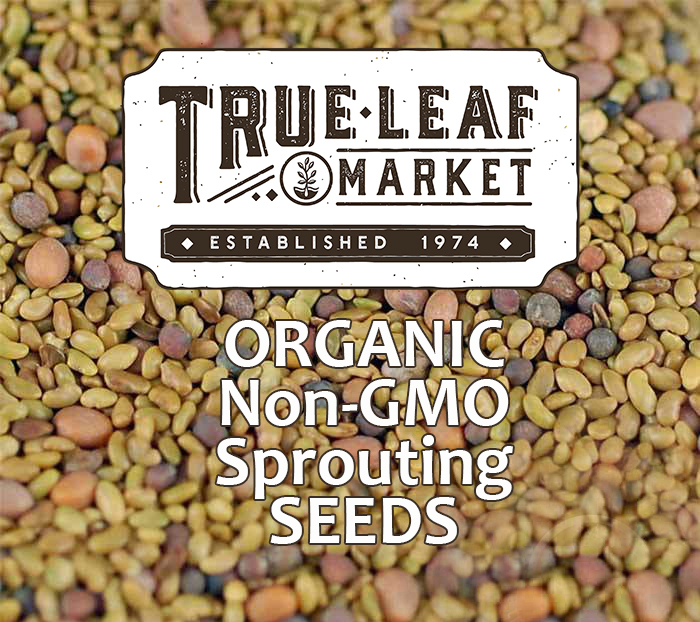 It is believed to be one of the oldest known leafy greens consumed by humans and is one of the original descendants of the Brassicaceae family of vegetables. Wild watercress is a source of isothiocyanates, like gluconasturtiin, which are in part responsible for its strong pungent flavor. Specific scientific research on the plant's compound PEITC, phenylethyl isothiocyanate, is found to exhibit the potential to suppress certain types of tumor growth. As a nutrient-rich wild food source, it has been utilized for its nutritious leafy stems both as a raw vegetable and steamed green. 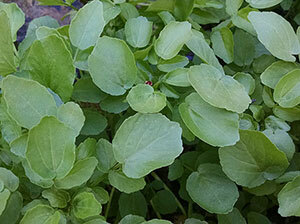 Similar to rocket lettuce or nasturtium leaf, it has a very spicy peppery sweet flavor. 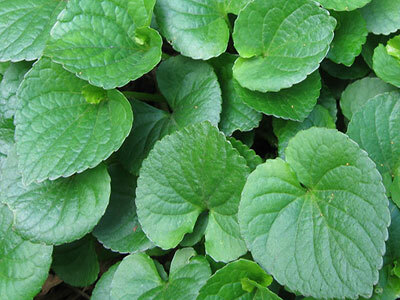 The leaves are also commonly employed in the culinary world for their unique taste and versatility, used in gourmet cuisine and the infamous "watercress soup." These are plants that come up year after year from either the same root system or from the seeds that they release. Some years, however, are more prolific than others depending on the amount of rainfall and other factors. Sometimes, seasonal conditions additionally may allow for other types wild edible greens to emerge rather than the ones you might be use to finding in local harvesting locations. 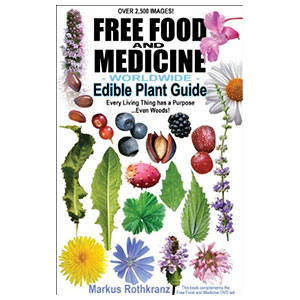 Visit our other pages for more on wild edibles like: madrone berries, pine pollen, wild rice and desert palm fruit in the links below. It is extremely important that you positively identify any wild edible plant before you harvest and eat it. 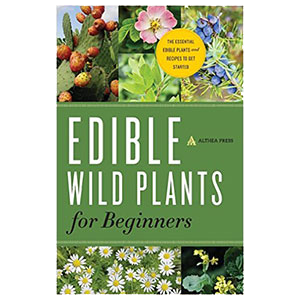 There are many poisonous and even deadly look-a-likes, so it is good to err on the side of caution and use a plant identification guide to get to know the specific wild edibles in your local area.